Hello friends! 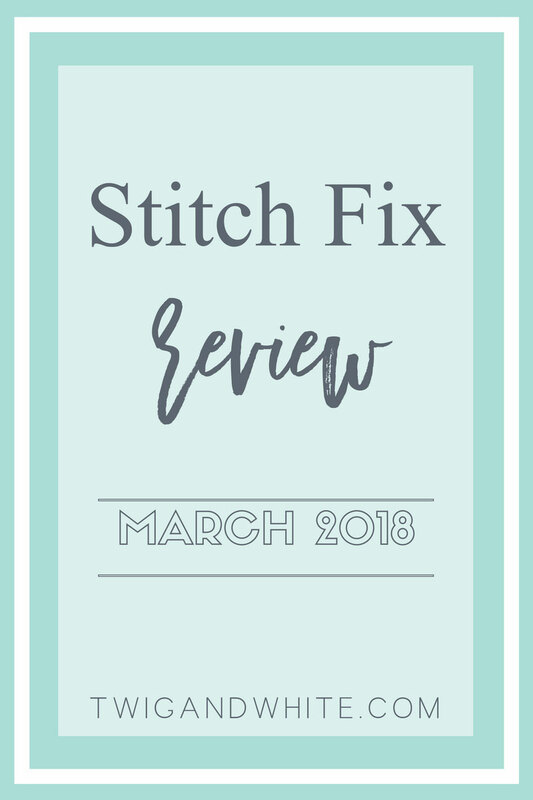 I’m back with another Stitch Fix update, this time for March 2018 and it’s a good one. I decided that for at least awhile to change my frequency to every other month. I feel like at least for the time being, I don’t need as many new things or at the very least, I’ve been feeling like there wasn’t anything in particular I wanted or needed. I’ve been going a bit more casual on studio days so I just haven’t had the need for a lot of variety. If you aren’t familiar with Stitch Fix, you need to get to it! It’s an online styling service where you get a personal stylist that will pick out five items for you from the profile that you fill out. You pick your style, colors, budget and frequency and your stylist will create your fix. Then you’ll get your fix delivered right to your door where you can try on the items in the privacy of your own home on your own time. Keep what you want and send the rest back in the prepaid USPS bag. There is a $20 styling fee for each fix but if you pick at least one item to purchase from your fix, that fee is applied to the cost of the item. Keep all five items and you get 25% off your total order! 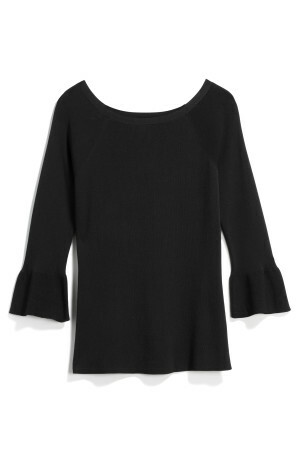 I’m always a sucker for a great blouse and this one is just that. 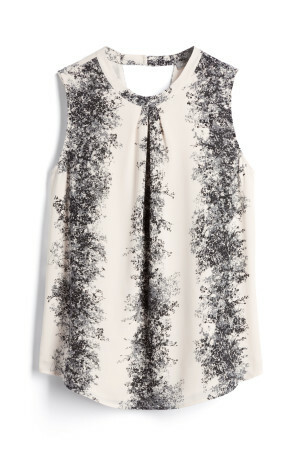 While it’s still winter here in the northeast, this blouse is perfect for layering too. That means I can wear it now and later, when the weather finally warms up. The pattern is also fun and unique. It looks like wide stripes from far away but up close it’s a scattered, tiny floral like pattern. As a graphic designer, this totally caught my eye. The back also has a fun, cross-over detail that shows a little skin while still being modest. KEEP: I kept the blouse for it’s unique details both pattern and in style. Blouses like this layer well for cooler weather but give me options for summer too. It’s also an item I can dress up with a pencil skirt or trousers or put on with jeans and some heels for a night out with the Mr. I can say quite honestly that I didn’t love this blouse. I like the length and the bell sleeves but the fabric felt like something my grandmother would have worn. It was a nice weight of fabric and felt like decent quality, it just didn’t feel like “me” and I have so much black already, I’m kind of looking for more color now I guess. RETURN: It should come as no surprise that I returned this top. Again, I like the bell sleeves but the fabric and color just felt like “meh”. 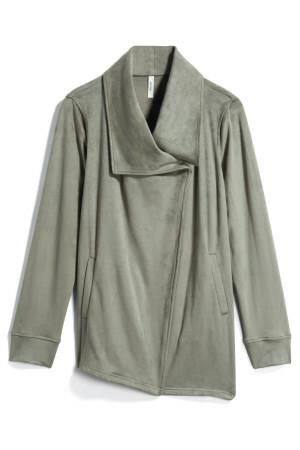 This jacket is cute, the color is kind of a sage green-grey and the suede was soft. The fabric was kind of thick which felt like a good quality but on me, it hung over my chest and didn’t have shape anywhere else making me look bigger than I am. I love alternatives to a standard blazer this time of year and this color would be a great alternative to a standard neutral but it just didn’t quite work for me. RETURN: Again, this shouldn’t be a surprise. I really wanted to love this jacket but I didn’t so it wasn’t worth keeping. This cardigan is so pretty and soft! The detail in the weave of the sweater makes it unique and the color isn’t solid which I love. It’s also super, super soft which I already said, but I’m telling you, it felt great. The length was just enough to cover my bum and the open style is of of my favorites right now. RETURN: I was on the fence with this item and actually kept my fix an extra day till I decided on this piece. 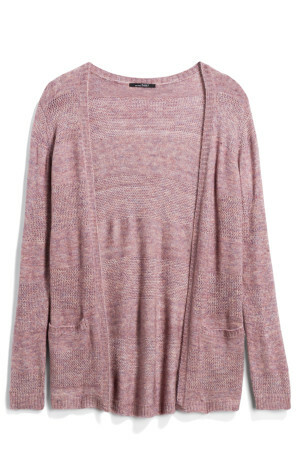 I ended up returning it only because my last fix included a mauve colored cardigan and this was a very similar color. Even though the styles are different, I just didn’t feel like two pinkish cardigans in a row was what I needed. Lately, my work uniform is jeans or joggers and I have mentioned to my stylist a few times that I’d love some alternatives to jeans that still have the versatility of jeans. Maybe that’s a tall order but she’s pulled through a couple times now, these included! 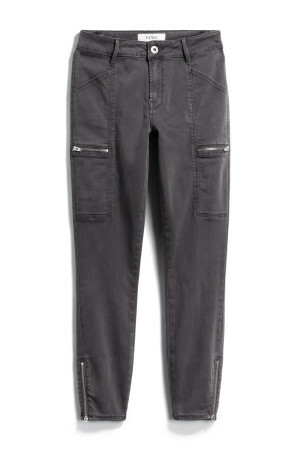 They have kind of a purplish-charcoal color to them which I thought was unique and the zippers add a fun detail making them a bit more unique than just plain old jeans. The zippers at the ankle remind me of jeans I wore in high school! Oh and the fabric is crazy soft. They feel like joggers but look like great pants! KEEP: Versatile alternative to jeans, check. Fun details, check. Soft and comfortable while still looking like I got dress, check! So what do you think? If you’d like to try Stitch Fix for yourself you can check it out here. You can also, SAVE THIS FOR LATER!